Update: Facebook has now officially announced the new 'Like' buttons, which are called Reactions and allow you to give alternative responses to the standard thumbs up. Chris Cox, Chief Product Officer at Facebook, shared a video of Reactions in action and said, "As you can see, it's not a 'dislike' button, though we hope it addresses the spirit of this request more broadly. "We studied which comments and reactions are most commonly and universally expressed across Facebook, then worked to design an experience around them that was elegant and fun." They're being trialled in Ireland and Spain from today and if successful will roll out to the rest of Facebook's users. Original story: Facebook's 'Like' button was introduced back in 2009 and changed the way we interacted with other people on the social network – and it's about to change again. 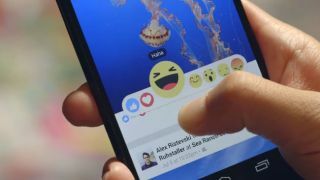 A new report suggests Facebook is preparing to introduce emotions to the platform, which will enable you to react with icons for laughter, anger, shock, love and more. Sources have told Engadget the feature is going to go live from tomorrow (October 9), with Ireland and Spain serving as test markets. If it's deemed successful then Facebook is sure to roll the feature out to the rest of the world. A 'Dislike' button has been rumoured for some time, and that idea has a new lease of life after being dragged up again in recent weeks. People have been asking for the feature as a way to give a suitable reaction to bad news posted on Facebook. If it's successful we can expect to see the social network bringing more emotions over time – although hopefully not too many. Because let's be honest: the 'like' button is a pretty lazy way of acknowledging someone's post. With an endless selection of one-click responses, what reason will we have to write actual comments anymore?